What involves the basic anatomy of a sponge? Sponges below to the Phylum Porifera and are parazoans that live in marine or aquatic habitats. They are the simplest animals as their body does not consist of true tissues but rather a loose colony of organized cells. Typically, a sponge consists of an osculum, pinacocytes, porocytes, ostia, choanocytes, spicules, archaeocytes, and water channels with each cell having a particular function. At the top of a sponge is a large hole or opening called an Osculum, in which water flows out. Pinacocytes are the “skin” cells” of a sponge and are thin, leathery, and tightly packed and surround the porocytes, which form the openings called ostia or “ostium = one pore” into the sponge’s body which allow water, 1000’s of L/day, into the sponge. Poriferans do not have any muscle cells, so their movement is rather limited. However, some poriferan cells can contract in a similar fashion as muscle cells. Porocytes (as well as cells called, myocytes) surround canal openings and pores can contract to regulate flow through the sponge. As sessile organisms, sponges grow attached to rocks, coral, shells, or other large submerged objects relying upon their food coming to them. 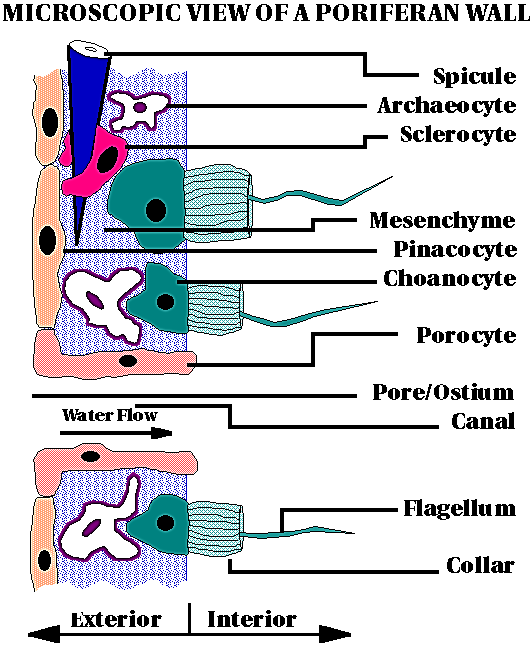 Sponges obtain nutrients by filtering the water column using flagellated choanocytes (collar cells) to assist with the movement of water through their porous bodies via water channels. As the flagella move, water is drawn through the porocytes and suspended nutrients are collected in the collars and phagocytized. Spicules or a framework of a fibrous protein called spongin forms the extracellular matrix and determines a sponge’s shape and hardness. Spicules that are composed of calcium carbonate, linear or three-rayed are typically softer whereas sponges that are made of silica spicules and six-rayed are harder. Spongin in bath sponges makes them useful in cleaning things and for absorbing water. Archaeocytes (amoebocytes) are very important to the functioning of a sponge. These cells are totipotent, which means that they can change into all of the other types of sponge cells. Archaeocytes can move and ingest and digest food caught by the choanocyte collars and transport nutrients to the other cells of the sponge (see Figure 1). In some sponges, archaeocytes develop into gametes. Three structural “grades” of canal systems (see Figure 2) are recognized in fossil and modern sponges: Asconoid, Syconoid, and Leuconoid. 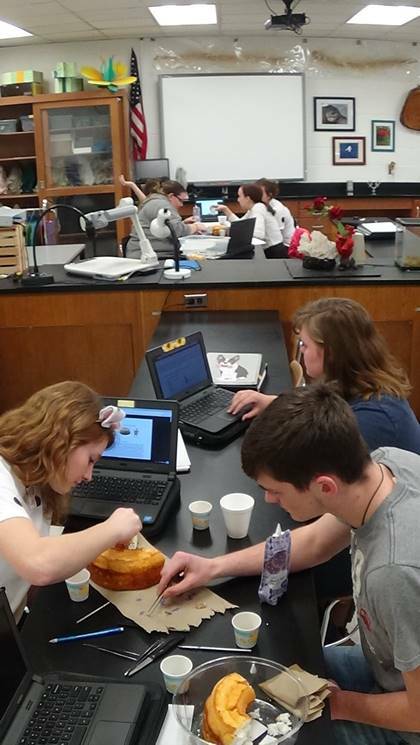 If one were to use a sponge cake, then a model of a structurally graded sponge called a Syconoid can be achieved. · Gather all necessary materials as and when directed. · Using a knife, carefully cut a 1/3 of the pre-make “sponge” cake out – (may eat). · Along each inside cross-section side, construct a model of a sponge’s anatomy using the materials provided. To give you a general idea of the concept (see Figure 1). 2. Use porocytes to line the inside of the major pore that was created. Note: you may wish to use the spray bottle and spray areas on the cake so candies stick better. 4. Place spicules through-out the inside walls of the cross section and even some outside. 5. Place archaeocytes through-out the inside walls of the cross section. 6. Place pinacocytes along the outside of the sponge cake. Note: may have to moisten the side of the cake with some water to get the pinacocytes to stick. Ø What grade of sponge was best created? Ø What the hypothesis proven or disproven? Ø What unforeseen events occurred during the activity? Ø What improvements could be made for this activity? Ø Why type of “springboard” question could be developed based off the problem question?